As Mother’s day is fast approaching, I would like to dedicate this to all the mothers in the world, to mothers who are surrogate, mothers who have lost their children and mothers who miscarried and most precisely to my mother. Mother, what should say about her? The whole world revolves around that one word. Mother bears a child for 9 months, nurtures him and creates a beautiful world for the family. Mother, an emotional creature, has tears for every situation, we cry when we’re happy and off course when we’re sad. From sleepless night to achy backs and dizzy heads, mother’s got everything but a cheerful child fills her heart bucket with love and she bounces back to life. A Mother smiles when her child smiles, laughs when they laugh and it breaks their heart when they get a tear or hurt. A Mother, who sits awake with her child late at night, while they study for their exam, makes them coffee/tea and makes sure they are comfortable. Mothers are so compassionate and selfless. Maternity leave, messy buns, dark circles, laundry pile-ups, changing diapers, rewards for potty trips, these are just a few charms of motherhood but it doesn’t come easy. Every age brings a different struggle to motherhood and coping with the situation gets hard at times. Well, once a mother always a mother! You change their nappies at once and soon you would be changing their children’s. A mother’s role doesn’t change even when she becomes a grandmother. She still loves to give it all to her children. Dance mom, soccer mom, and hockey mom, taekwondo mom, driving across the town for extra classes, making up for your kid’s routines and activities, organizing play dates and showing up for all their competitions, recitals and arts night, is every mom’s story. Moms are superpowers, running errands, finishing house chores, working in the office, attending business meetings and even an overwhelming day doesn’t stop them from kissing good night to their little ones. From the chauffeur to the cleaner, nurse, chef, tutor, consultant, formalist, enforcer and much more, a Mom knows how to play all the roles secretly. She was well educated but didn’t think about making a career and sacrificed it due to having kids early in her life. She mentioned a couple of times how easy it was to do B.ED (most of the women still choose to be a teacher back home) but she wanted to be just with us. She planted the seed of good values in us and guided us whenever needed. She gave us all her time and energy and most of all, her immense love. My mother knew to how to respect family and elders. My grandfather was the first one to be fed at the table, before my dad and children. She’s always been spiritual and integrated the family values in all of us. It’s been so many years since I met them; my eyes are now longing to see her. As the life cycle created by nature, I think God wanted me to follow her legacy and I too began a new phase of life at 21 and had my son at 23, I don’t know if I was ready then. Unlike my mother, I was ambitious, prepared for Medical exams and was taking tuitions for MBBS but my destiny had planned something else. But as soon as I became a mother, my life changed. Days turned into years, I didn’t realize how years flew by and now I am blessed with 2 boys who look and behave like twins but 8 years apart. Both, my boys are very excited about surprising me on “Mother’s day” and kept asking me what I want, J Love to see them happy and learning ways of life, like every mother, my happiness lies is their smile and success!!!! 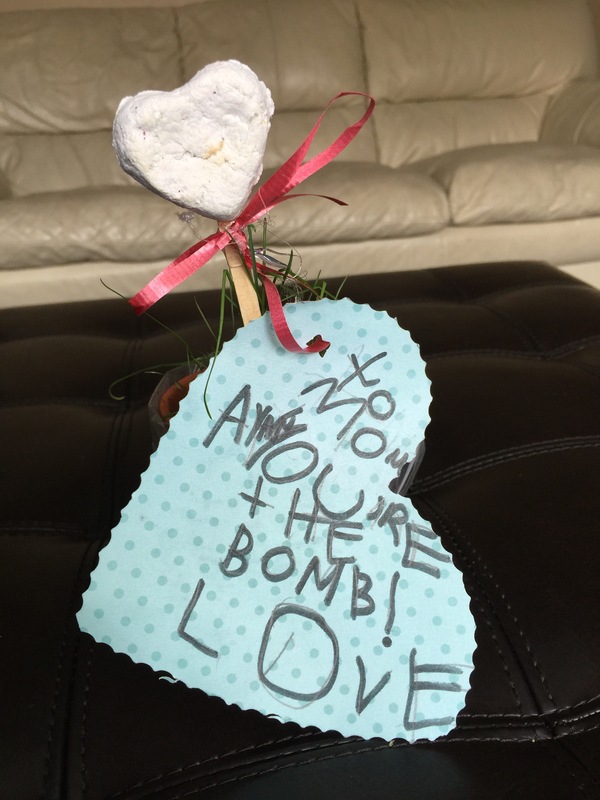 Well, both chose to surprise me yesterday, the little one with a plant from school with the note that said, “Mom, you’re the BOMB”!!! 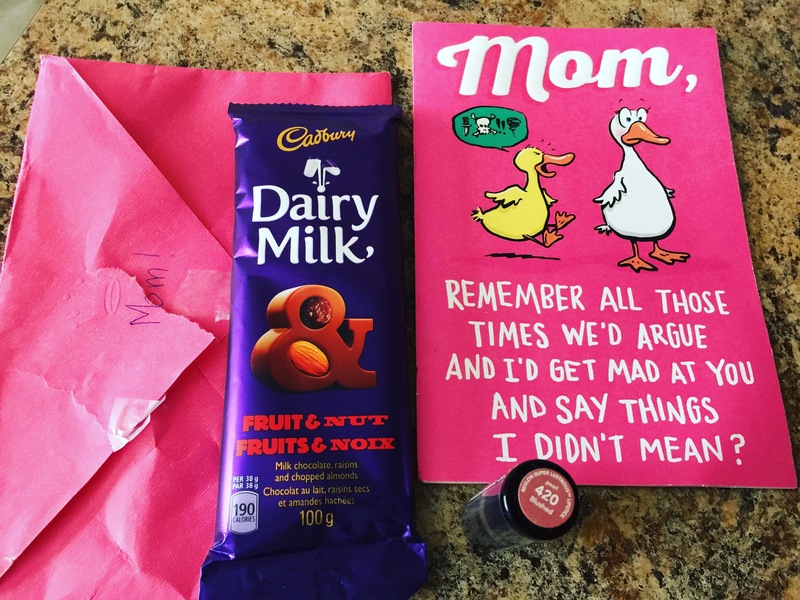 🙂 And off course my sometimes matured young man with a beautiful card, chocolates, and a lipstick. This post couldn’t be completed without a mention of my Mother in law; she is strong and independent. I admire her for her strong nature and the sense of selflessness. She lived and worked alone while raising 3 great kids. She is the one who never complains, she had a massive heart attack a few years ago. We were in tears and were longing to meet her. We were dying to speak to her but couldn’t as she was in the hospital. But when got hold of her, she said, “She’s all good and we don’t have to worry about anything” but in reality, she was in bad shape. She’s the one who doesn’t like to see her children in stress, she’s so selfless. Have a Happy Mother’s day mommies!!! Enjoy your little creations and love every part of their growing. Previous Post Why won’t they hire you? Next Post Life is a journey, not a destination!